How could Rei wound Kurona and Nashiro by knives? Why don't the Doves use ordinary rifles and swords instead of Kagune to attack ghouls? These instances are contradictory and paradoxical. Please give an explanation which makes all these instances reasonable. 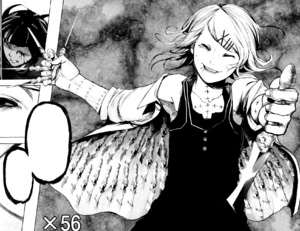 First of all, Suzuya did not use just any knives, he used a bikaku quinque in the form of knives, the Scorpion 1/56. Thus, since they are made from kagune, these knives can pierce ghoul skin and thus cut Kurona and Nashiro. Scorpion 1/56 (サソリ1/56, Sasori 1/56) is a bikaku quinque that takes the form of a switchblade. They are currently wielded by Juuzou Suzuya. It is a set of totally 56 blades which can be used both as a melee and ranged weapon. The CCG do use regular guns and other modern weaponry, but they are loaded with Q bullets, which are also manufactured from Kagune, thus, they can harm ghouls. Q bullets are bullets with a melted down kagune coating; however, because the material can only be acquired by ghouls, the coating itself is moderately thin. Therefore, in both instances, weaponry manufactured from kagune are used, which is the only known material to be able to harm ghouls without the use of RC suppressants. Now for the true answer to the question. Can a ghoul be harmed by earthly weapons? Yes, yes they can, but only under certain conditions. One cause is Rc suppressants, which effectively makes the ghouls human. Furthermore, this is available in gas form as shown by the Aogiri raid on Cochlea in Episode 4 of Tokyo Ghoul √A. Thus, under certain conditions, ghouls can be harmed by conventional weapons, so it is not odd for them to use such weapons. However, there has not been a single instance where conventional weapons worked in combat without RC suppressants. Rc suppressants (Rc抑制液, Rc yokuseieki) are a drug used to suppress the activity of the Kakuhou. They are primarily used by the Commission of Counter Ghoul on Ghoul prisoners, for the purpose of keeping them weakened or for interrogation. It slows regeneration, impairs the Kagune, and makes their bodies vulnerable to mundane items such as knives or needles. But of course, as stated by lentinant, a strong enough force would most likely be sufficient to pierce the skin and hurt the ghouls, but kagune-based weapons are used most likely out of their effectiveness and swiftness in piercing ghoul skin than other more expensive and large impractical weapons such as a railgun or AMRs as stated by Ryan, which are bulky and hard to maneuver against a speedy ghoul that would rush towards a sniper if there was no infantry to guard against the ghouls, these infantry would of course have to use weapons that are reliable in close combat, such as swords and knives, which need to be made of kagune to pierce the ghoul skin. A good measurement for close combat in ghouls is Nishiki's skin scrape, which seems to only have reached the hypodermis as the blood vessels and muscle tissue can be seen. 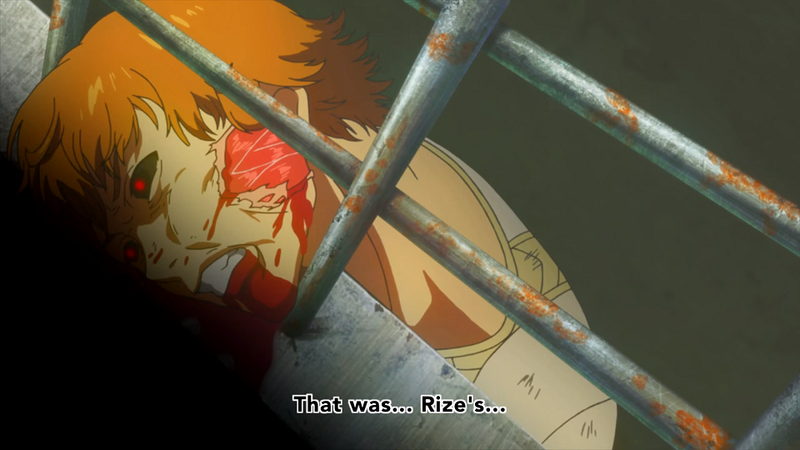 This scrape was a result of Kaneki throwing him up about 5 metres (using the van beside kaneki as about 2 metres as measurement) in about 1 second in this video at 0.48, that would mean an acceleration of about 15ms^-2 after accounting for gravity, which means 885N of force since Nishiki is 59kg, implying a pressure of 354kPa is needed to pierce the skin assuming the scrape is a square 5cm in length. This force is 3 times the pressure of the atmosphere, which clearly is difficult to exert from a human, thus, kagune based weapons are opted for by the CCG in close combat. Can someone help me interpret the end of root A? Can a person who was converted into half Ghoul by replacing parts of his organs be reverted to human by replacing those organs with human ones? Can Ghouls be killed with bullets? What are these kind of beam weapons used by Ghoul Investigators?